For Mini fans who want to further increase the Go-Kart feeling of the strongest series Mini (231 hp, 170 kW), will find KW coilovers that are made of stainless steel the perfect accessory. While the KW Variant 1, 2, 3 and the Clubsport coilovers are mainly designed for increased driving dynamics and allow for lowering up to 45 mm, the KW Street Comfort suspension kit is recommended for all Mini friends, who are not satisfied with the long-term Go-Kart feeling in everyday life. Compared to the standard suspension, the KW Street Comfort with its spring rate and damper adjustment is designed to provide a more comfortable ride, without having to give up handling characteristics. The stainless steel suspension kits also feature more advantages besides a continuous lowering. We from KW offer the perfect suspension kit for every demand. 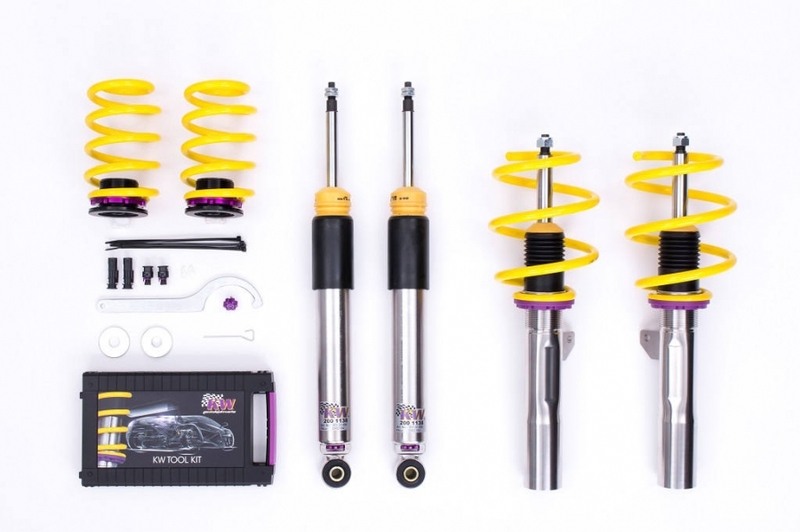 If somebody wants a significant increase in performance on the race track and on the street for his Mini, we recommend the KW Clubsport coilover kit. If the driving comfort needs to be increased, we offer a Street Comfort suspension kit that also allows for a continuous lowering. 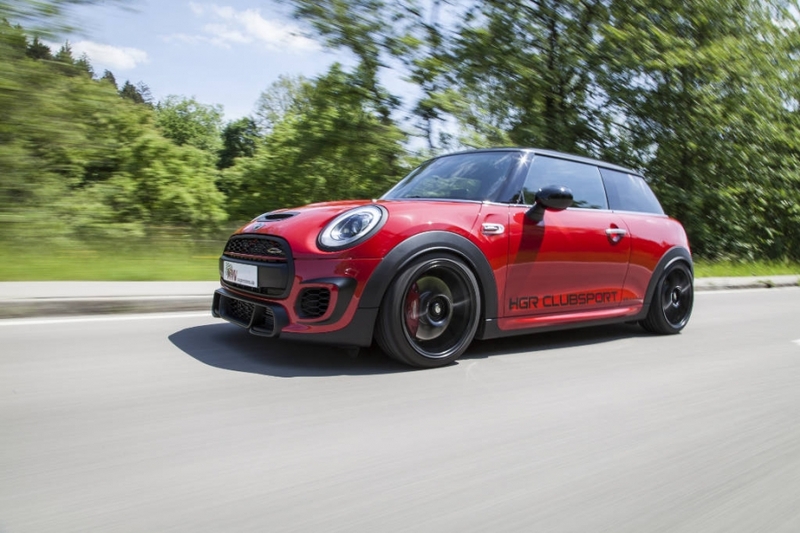 The Mini John Cooper Works with the KW Clubsport coilover kit brings the strongest Mini series of all times to its full potential. The KW Clubsport is the perfect performance tool for track days since the KW technology has proven to be successful in racing and is maintenance-friendly with high-quality components. 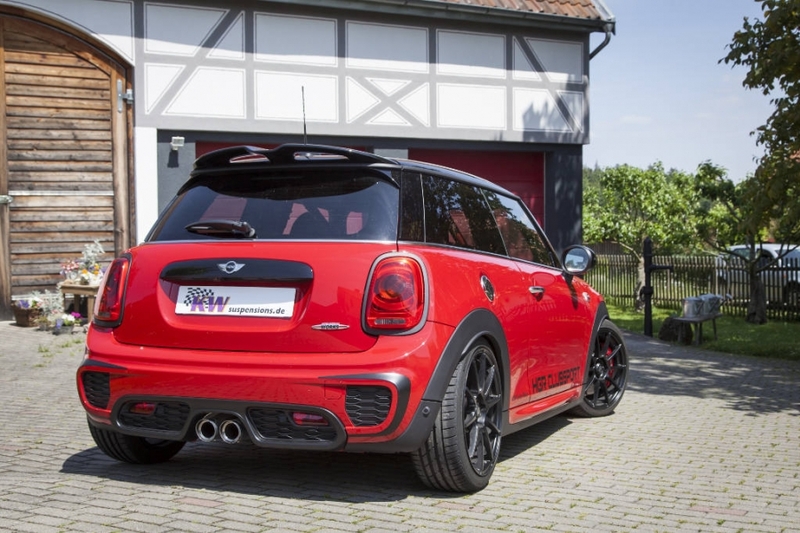 In the first testing reports about the ‘JCW’, sometimes the uncompromised and typical Go-Kart-feeling of the previous model was missed, on why we has developed the KW Clubsport kit for the “Sport-Mini”. And as soon as the John Cooper Works was available, we already received the first inquiries of a track day coilover kit. For the KW Clubsport kit, racing springs and high performance dampers are used in order to optimally use the characteristics of sport tires and semi slicks at track days. The dampers are adjustable in rebound with 16 clicks and twelve clicks in compression damping. In addition, the KW Clubsport coilover kit has adjustable top mounts which allow adjusting the camber in a way, that the wheels always have an optimum contact surface when driving in curves. The aluminum Unibal top mounts are exclusively available for the KW Clubsport coilovers. For those who won’t be taking their ‘JCW’ on race tracks often but still have a high performance demand, we recommend the KW Variant 3. Similar to the Clubsport version, rebound forces can be independently adjusted with 16 clicks and the compression forces with twelve clicks. The difference between these two KW suspensions kits lies within the details. While the KW Clubsport coilover kit has race sport springs and high performance dampers with a valve assembly designed for race track use and semi slicks tires, KW has developed the Variant 3 as an alternative for the sporty street use with street tires. Drivers, who desire less adjustment reserves and individual setup parameters, will find an alternative to further adjust the handling characteristics with the KW coilovers Variant 2 with adjustable rebound valve. Those who mostly look for an attractive lowering with an improved driving dynamics will find the perfect suspension kit for the Mini John Cooper Works with the proven KW coilovers Variant 1. If the sporty setup of the Mini-John-Cooper-Works-series suspension kit is too inharmonious after a while, or if the Mini is mainly driven on bad roads, the KW Street Comfort suspension kit is the ideal alternative. Besides a continuous lowering of 15 – 35 mm, it convinces by the comfort-oriented setup. The spring rate and the damper setup are designed for harmonious driving, without that the handling suffers at fast load changes. Just like the Variant 2, the Street Comfort suspension kit can also be varied in rebound damping with 16 clicks in order to setup the suspension kit to be more comfortable or stiffer.